Mussoorie is a hill station nestled in the foot hills of the Garhwal Himalayan ranges in Northern India. Mussoorie Beyond the Mall details 22 Day-Walks in and around this stunning beautiful region. The good news is that proceeds from the sale of this book goes to fund important medical research in India. If you love hiking through pristine environments and at the same time improving the lives of others then read on. For most visitors to Mussoorie, the Mall is the beginning and the end. Most tourists take a walk or cycle rickshaw along the Mall, do a little shopping, perhaps take the ropeway up to Gun Hill, and enjoy a meal in one of the numerous restaurants along the Mall. But as the title of this book suggests, there is much more to see and do beyond the Mall. The motivation for us to produce this book was to assist others to discover the beauty of the hills beyond the Mall. We have been lucky enough to spend extended periods in Mussoorie so have had plenty of time to discover these walks. But those of you who visit Mussoorie for only days or weeks have no time to waste on dead-ends. The maps in this book were constructed by the authors using a global positioning system device, so they are all to scale. At the front of the book you will find a master map that covers all of the 22 walks. For each walk, we then provide a detailed map as well as a graph showing the altitude, and numbered steps to guide you along each section of the walk. All of the walks in this book can be completed within a day. So you can have a nice sleep in a comfortable bed, breakfast, a picnic or restaurant lunch at some stage on the walk, and then be back for a great meal in the evening. 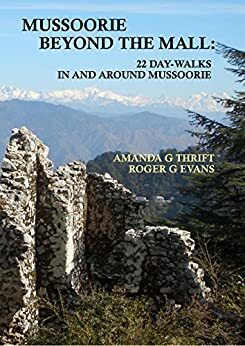 We begin with two short walks (~ 1 h) to help you acclimatise to the altitude and then three longer (~4 h) but relatively easy walks to familiarise you with the geography and topology of greater Mussoorie beyond the Library to the west and beyond the Picture Palace to the east. The rest of the walks take you further afield, and in some cases you will ascend and descend 1000 metres in a day. For some walks, we advise that you take a taxi to a point at some distance from Mussoorie and follow some of the small tracks back to town. In all cases, you should consider the recommended track as just that. Feel confident that you can take your own path using our suggested route as a guide. The terrain around Mussoorie is steep, so some of the walks are quite strenuous. So take it easy for the first few days until you get your ‘mountain legs’. The authors are both in their fifties and have sedentary occupations, so none of the walks are really difficult. The times we have set aside for the walks include time for dawdling, lunch and admiring the views. We hope you come to love this place like we do! Some of these walks are to rather remote spots and through steep terrain. You will require sturdy walking boots for all but the shortest walks in the book. We find it useful to take along a walking stick to help keep ourselves upright on steep descents. You should also make sure you take plenty of drinking water along with you. We hope this book will help you get the most out of your brief visit to Mussoorie so you will want to come back for more!